We rode in rain throughout the morning. “Damn that Martin!” we thought, as we labored up the hill. 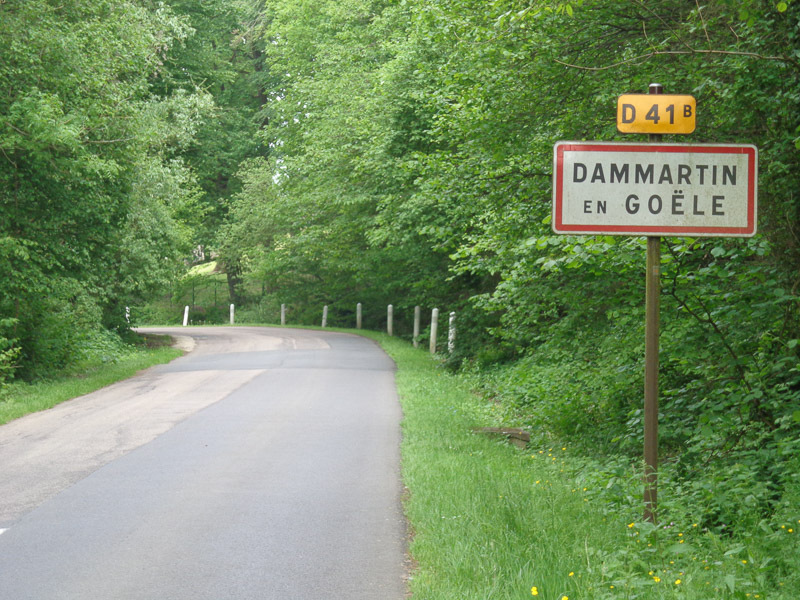 We climbed out of Saint Mard to Dammartin-en-Goele on a nicely paved road, and then continued climbing on a continually narrower and less well paved road out of Dammartin until the pavement ended and the road turned to dirt. Being our first experience with the GPS doing this to us, we thought the dirt road must be a well-traveled road, so we continued. 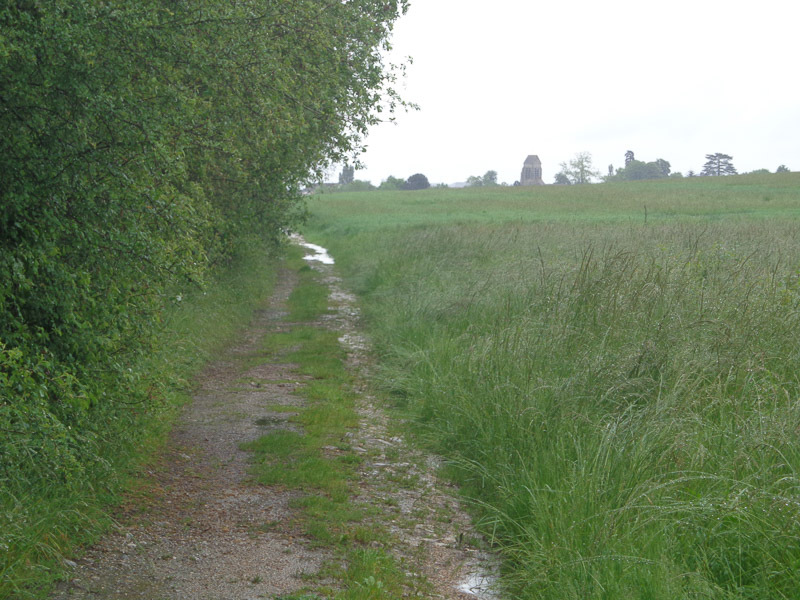 It quickly became narrower and narrower, then two tracks in the mud, and finally single track. 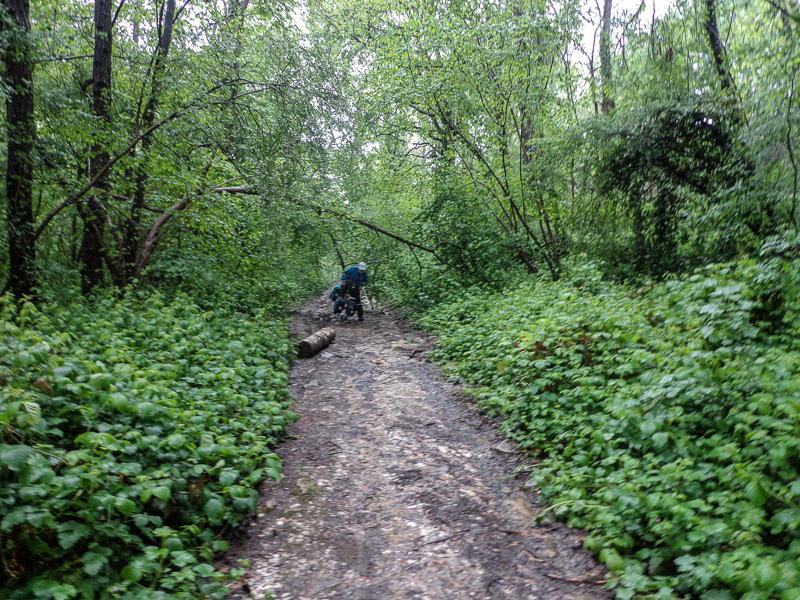 We had no idea where it would lead, but we also had no idea how to backtrack and figure out a new route in the rain without internet, so we pressed on. We started descending. Thank god we were headed down the hill and not climbing it, because the track was quite steep and with all the rain of the last several days, much too muddy to ascend. It was pretty unnerving, but now that we’d started down, we had no choice but to continue and hope it led to a road. This photo doesn’t even begin to convey how steep and muddy the track was! Eventually the track leveled out onto a farmer’s field, became two tire tracks again, and about a kilometer later, we rolled into the back parking lot of an industrial building. We went around the building and arrived on a paved road again. Thank god the facility’s front fence wasn’t locked! Just a few hundred meters later, the GPS directed us to turn right, off the paved road, and onto a dirt road again! What’s up with that??? 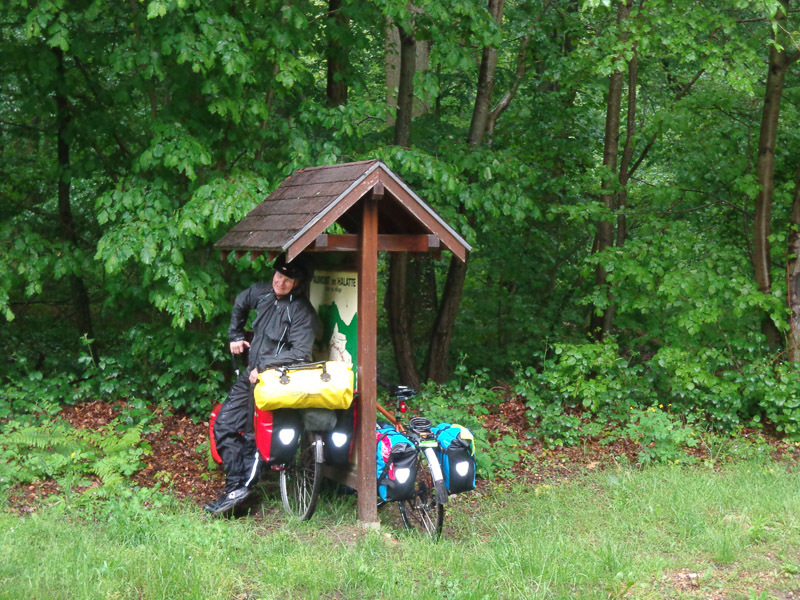 When Mark built the route on the GPS, he specifically selected the “bicycle touring” option, not the “mountain biking” option. These muddy tracks would be a bit of a challenge on an unloaded road bike. But fully loaded, weighing nearly 100 pounds apiece, this was hell! What is Garmin thinking, directing touring bicycles on dirt tracks??? With the help Google Maps on Julie’s phone (our only semi-reliable source of internet), and with many false turns, we were able to find our way on paved roads instead of the most direct but sketchy route through farmers’ fields. After finally extricating Julie’s shoe from the pedal, we found a bar where we could get out of the pouring rain and warm up with a sandwich and a warm cup of coffee. Odd plaques on the wall opposite the bar where we warmed up. 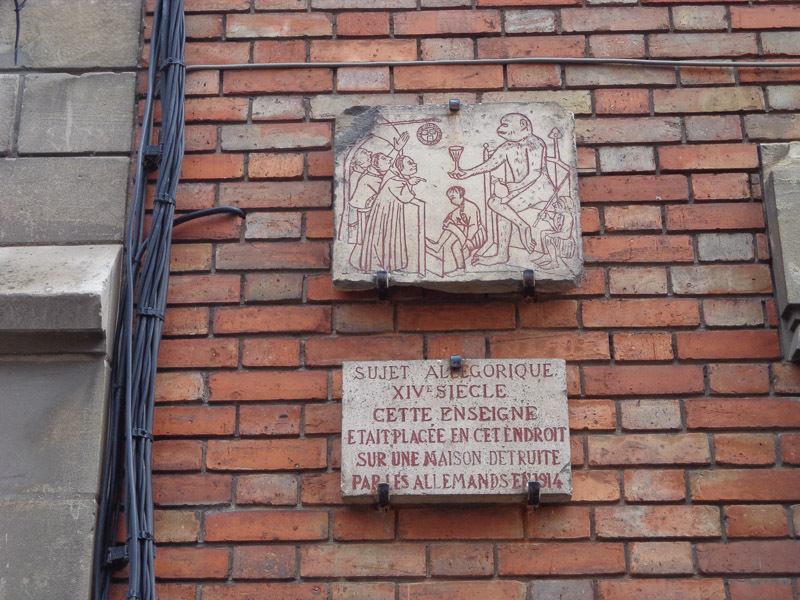 According to Google Translate, bottom plaque reads: “Allegorical subject. 14th Century. This sign was located in this place on a house destroyed by the Germans in 1914.” Is the monkey supposed to be representative of the Germans? Finally, we braved the now intermittent rain to head towards our campground. 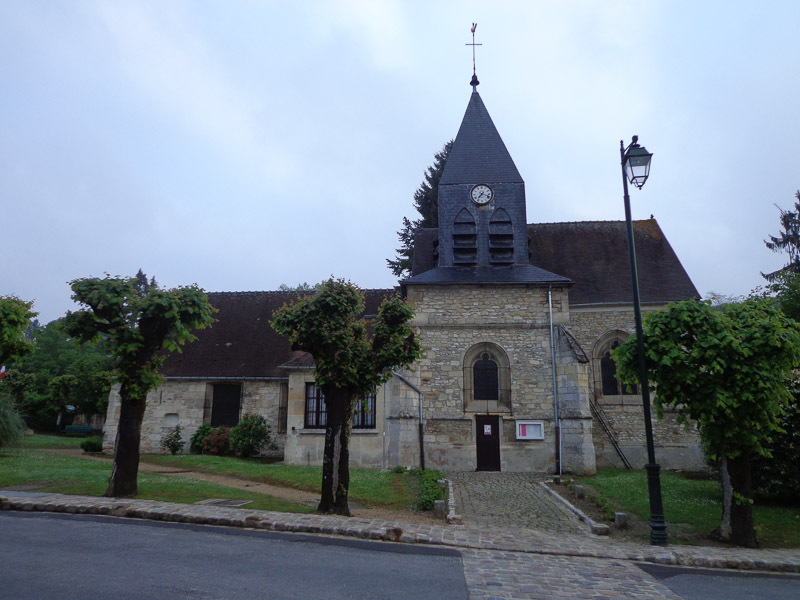 Once we arrived in Aumont-en-Halette, however, we discovered that the campground where we’d planned to stay no longer exists, and nobody could direct us to another campground anywhere nearby. This was a very quiet town. 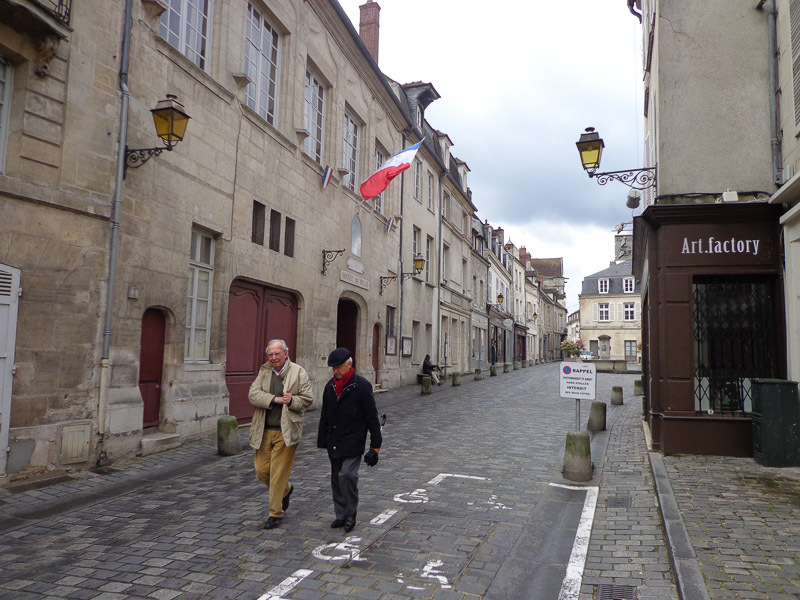 We couldn’t even find a bar or bakery…where do these people get their coffee or baguette in the morning? Given the very nice, and rather large houses behind security gates and alarm systems, and the very few people about, we got the sense that this is where the 1% of Paris (or at least the 10%) go to escape the city on the weekend. The rain had stopped by now, and with no campground in the area, this was a chance for our first free camp! The local cathedral (every town has at least one) sat at the top of the hill, on the single traffic circle in town. One side of the cathedral faced the road and the nonexistent traffic, one side faced a large parking lot, and the other two were hemmed in by tall, stone walls separating the church from its neighbors. The backside of the church was perfectly hidden! 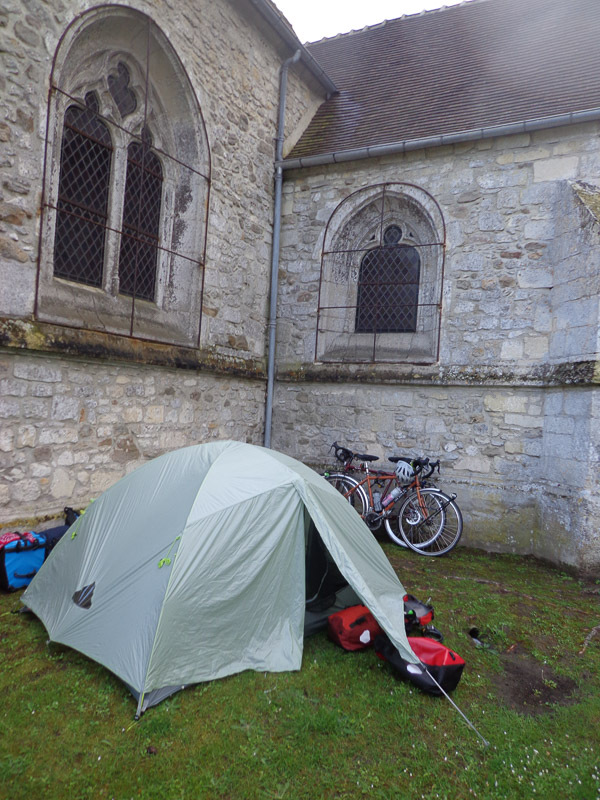 We decided to surreptitiously camp behind the church, nestled in the crook between the transept and the choir. It was the perfect free camp! The church bell even stopped tolling at 10:00pm. Now this is the romance of the road we were envisioning! After a few false starts, we had well and truly begun our adventure! Glad to hear you are enjoying yourselves! Sounds like QUITE an adventure! Moving forward may your roads be paved, your waterproofing resolute, and your senses of humor intact! Forza!! You guys are doing great and the adventures are already quite spectacular. I read again your first post on your blog…you were psychic, but it all applies. I notice however that on your recent posts the dates don’t show up in my browser (on an IPad using Chrome) as correct. Hi Dave, I have been manually changing the date so that the blogs are dated in May – the thinking being that when it all archives, the May adventures will be found in “May”, not in June or whenever we get a chance to post them. Sounds like this is muddying the waters, however, so I guess I should go back to using the default date. Thanks for bringing this confusion to my attention! Paper maps are needed for those times when the GPS throws the Wang Chung at you and routes you off a cliff. I carry both. Strategic planning with paper and tactical decisions with Mr. Wizard (GPS). Navigation errors are costly……. We really like your stories and we are impressed by your braveness. We are wondering how far away you are from Drachten, the Netherlands and if you are still planning to visit us. We are currently in Dunkirque, France, but we got word that they’ve processed Mark’s visa paperwork much more quickly than anticipated. 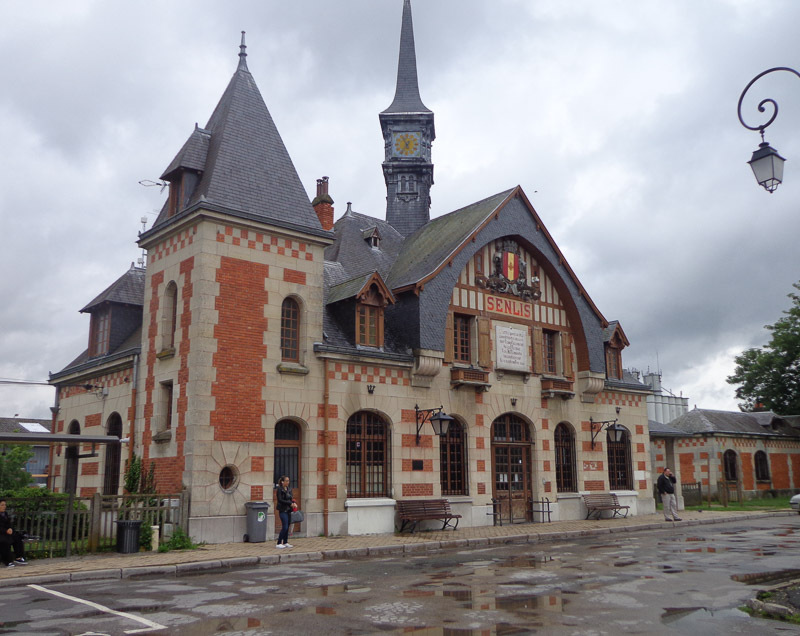 So, we’ll soon be taking the train to Strasbourg for his appointment at the prefecture. We’re not sure how long it will take to actually get the visa in hand after his appointment, so we don’t have an itinerary much beyond that at this point. We definitely still want to visit you in Drachten, if we can get there before you leave on your vacation. Boy, you guys have really had a lot of rain! I’m so impressed how you are soldiering on, even during the horrid cleat ordeal. So glad you were rewarded with a free night of camping. I was told by a woman who hiked on an ancient trail through France that some of the small villages get their food from supply trucks that service them weekly. One would have to be a good meal planner! The hikers had to rely on the kindness of the town folk to give them meals as there were no restaurants or grocery stores. Thankfully, you are prepared for almost anything, even if its cowboy style. So glad you are having fun and have really begun your adventure!! That explains how they get provisions out in the boondocks! What an utterly awesome camping spot!!! Even without coffee and baguette! Definitely our most picturesque spot to date!